Sometime last September a new IKEA catalogue showed up in our mail box. I tossed it on the counter along with the bills, promises for better wireless service, and an abundance of local grocery fliers. Later that week I pulled out the catalogue. (This is strange behavior for me: I never flip through catalogues.) 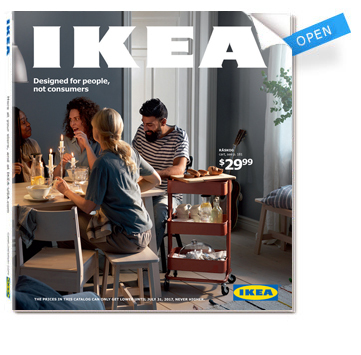 But for some reason, this catalogue from IKEA captured my interest with the promise of some much-needed lunchtime distraction. I opened to a page with a photo of people younger than me, sitting around a coffee table, sharing a meal. The message of the days of “have to” being over, and of the importance of just being together? They rang true. I flipped to the next page. And the next. During lunch, I continued to browse through the IKEA catalogue. Not because I was looking for furniture, but because I wanted to read the copy in the catalogue. I’m not saying I think we all need to run to IKEA and get a new set of décor. But I do think as marketers speaking to an HR audience, we can learn from this experience. Like the pile of unwanted mail I found in my mail box, HR professionals receive messages from every corner of their lives. If we want to make a connection, we need to provide a meaningful story about our products and services. The power of the IKEA catalogue was that it told a story. I was pulled in with pictures and copy that went beyond showing me the latest and greatest new item from IKEA. Sure, those were included—they had a new bowl that was only 99 cents! But that new, cheap bowl wasn’t the focus. The focus of the story that resonated with me was about the importance of gathering together for meals—regardless of the type of table. Regardless of the state of my kitchen, dirty floors, or flatware that doesn’t match. You might be thinking that cool couches and new dishes are easier to sell than HR products and services. An example from Intuit illustrates how the power of story can change that. The information and insight you gather will help you become a better, more relevant storyteller for your HR readers. When you focus on the story you’re telling, as well as the people reading the story, your copy might just make your readers pour over your message as they eat their lunch. Like this post? Subscribe to my monthly newsletter, HR Matters!